Before I get too far into all your gloriousness, I want to remind you that the Christmas Pintester Movement approacheth! November 15th is when it all goes down, and it’s coming up quick, so grab the details and get to crafting. Good suggestions, all of them. Well… 4 out of 5.
brigidkeely • Part of the point of the “recipe” is that the pumpkin puree has fat and protein already in it, so you can skip the oil and egg in theory. My instincts are that it’s still going to be dense, much denser than a typical cupcake, but some people prefer that or even just want a quick bread type texture. However, this looks pretty awful and I’m going to jump on the stand mixer for that… not that you’re awful for using it to make cupcakes from a mix instead of making artisanal bread or home made yoghurt or whatever, but because the stand mixer is powerful and the cupcakes got over mixed. Any cupcake or cake that’s over mixed will turn out dense and rubbery, whether you add the egg to it or not. Probably you don’t care! But I’d be really interested if other people who followed the recipe as written but mixed by hand had different texture results. Well, oops. But, yeah, I actually don’t care that much and will probably continue to over-mix my batters because I like the noise my mixer makes when I turn it on high. But other bakers-of-stuff take note! You may not want to use your KitchenAid for… uh… some stuff. FluffyGirl • Yeah, I’ve done that pin, too. I still make them, but smooth out the embarrassing lumps (would that I could do that to my thighs). I’ve found that the CoolWhip Chocolate Frosting is the perfect topping for these. My vegetable-averse husband and daughter love them, and I get to snicker to myself because they’re eating healthy’ish. 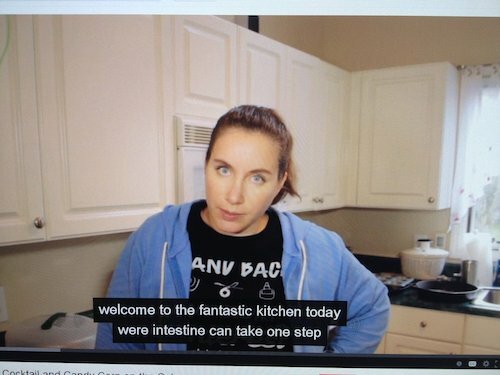 So in last week’s video there was a lot to laugh at, not the least of which was YouTube’s automatic close-captioning. Ashley Chesson • hate to spam, but i turned on cc accidentally and this happened and it needs to be shared. Don’t you take another step, you motherfucking intestine. Leigh • It’s not magic; it’s science. Rice is naturally absorbent and holds at least twice its volume in water. And water molecules form strong adhesive attractions to one another, so one water molecule follows the previous water molecule out of the phone and into the rice like a giant water-molecule conga line. Sandi Boyd • I am picturing this in my head like a cartoon from the ’60’s. It is awesome, and I think it should be produced by someone immediately! In this week's round-up of all of last week's best blog comments, the Pintester highlights some close-caption fails, pumpkin goodness, and a water conga line. I love turning on the captions. I watch each video twice. Once with and once without. Hot damn. Made it again! OMG! Go to 2:56 on the pumpkintini one with the closed captioning on! AWESOME!